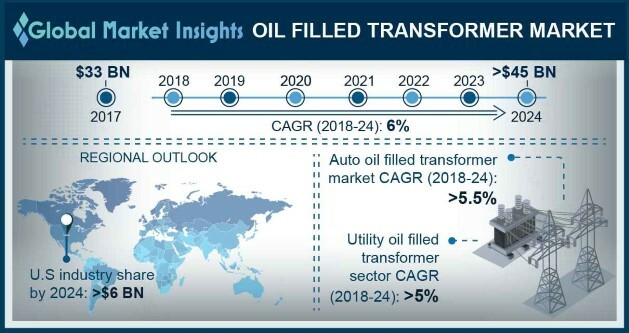 Oil Filled Transformer Market size will exceed USD 45 Billion by 2024, as reported in the latest study by Global Market Insights, Inc. Rising expenditure toward the expansion of electric infrastructure coupled with favorable regulatory measures for the refurbishment of existing grid networks will drive the global oil filled transformer market size. According to the Federal Energy Regulatory Commission (FERC), it has tripled the transmission expenditures in 2015 to over USD 15 billion in comparison to its investments in 2006. Significant upsurge in the demand for electricity due to ongoing urbanization and commercialization will further propel the industry dynamics. The U.S. oil filled transformer market is predicted to expand over 4% by 2024. Ongoing technological enhancements for the provision of reliable grid support systems along with massive government funding for the establishment of cross border transmission networks will boost the industry growth. 5 to 10 MVA oil immersed transformer market size will witness growth subject to rampant commercial & industrial expansion. Rapid deployment of these units across medium voltage applications will further fuel the product landscape. Favorable government initiatives including feed in tariffs (FITs) and incentivization policies toward the establishment of sustainable energy infrastructure will boost the single phase oil filled transformer market growth. Deployment of efficient transformer units in small scale industries across developing nations will further provide a stimulus to the industry landscape. Closed core oil filled transformer market will witness growth on account of its vast applicability across medium and low voltage electricity networks. Properties including effectual mechanical strength, reduced iron losses and flux leakage will significantly boost the product adoption. Surging electricity demand from the ever increasing population coupled with favorable regulatory regime toward rural electrification will drive the Middle East & Africa oil filled transformer market growth. The Government of West Africa, in 2014, launched the National Program for Rural Electrification (PRONER) with an aim to increase the electricity penetration rate by 80% by 2020. Transmission networks will witness substantial growth on account of government measures toward the expansion of high voltage grid networks for long distance power supply. Establishment of renewable energy networks to fulfil the energy demand along with subsequent upgrading of power networks for optimized energy consumption will in turn drive the transmission oil filled transformer market size. Notable industry players in the oil filled transformer market comprise General Electric, Siemens, ABB, Eaton Corporation, Ormazabal, Toshiba Corporation and LSIS Co. amongst others. Extensive R&D, product accreditations coupled with strengthened distributary network are some of the key assets that provide a competitive edge to the industry players.